Rhonda Lieberman has always known, like furever, that art and cats are on the same team. Bringing them into each other’s frame has long been her mission, finally realized in the traveling art circus that is her Cats-in-Residence Program—proof that art and cats are mutually affirming aesthetic forces. In collaboration with nine feline purrformers, the show is part performance piece, part curated exhibition, part social sculpture, part meditation hangout, and (large) part adoption cativism. Someone told me there are upwards of eighty-five million pet cats in America; Lieberman thinks we can do better. This is the third installment of her nomadic project (which is in search of a permanent institutional home). It debuted in Lieberman’s “The Cat Show” at White Columns in 2013 and followed up with a recent stint at Real Art Ways in Hartford, Connecticut. Those first two showings set the adoption bar high, placing forty-three shelter cats into homes. Its LA iteration also marks the end of a trilogy of feline shows at 356 S. Mission Road, preceded this past summer by “Another Cats Show” (featuring what felt like and actually was 250 puss-in-boots-loving artists) and those spectacular huge blooms painted by the felicitously named Alex Katz before that. 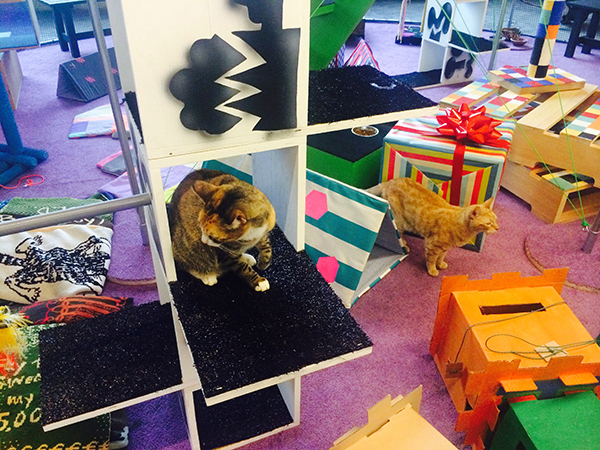 Left and right: The Cats-in-Residence Program at 356 S. Mission Road. The action is packed inside a big, netted cylinder enclosure—the CatAviary, designed by Gia Wolff and Freecell—lined with wall-to-wall purple carpeting and furnished with artist-made cozy crawl spaces, crates, cushions, climbing structures, scratch posts, cat dancers, a catnip-covered portrait bust, and dining ware…everything the resident rescue kitties could want from domestic life. Jonathan Horowitz’s carpeted Cat Pedestal is both highly scratchable and a tidy way to display cat-as-sculpture: win-win. Joe Scanlan’s upholstered pallets and Ruth Root’s fabric Cat Tunnels and Cat-nap Mats are neo-geo color-block playgrounds. Sam Roeck’s luxury-loft condo tower and Dane Johnson’s twin high-rises are favorites with aspiring fat cats who prefur an aloof perch where they can play at being 1 purrcenters, napping between existential yawns emitting a whiff of ennui—or is that tuna? Down below is Paul McMahon’s cardboard Kitty City for underground slinking and shady hideouts. There are chunky ceramic water bowls by Ann Leese and sloganeering knit pillows by Lisa Anne Auerbach. An elaborate tube maze hangs suspended like a treetop canopy, or maybe that’s the molecular structure of happiness. A video of chirping birdies runs at cat-eye level, the sound track of simple dreams. The Sunday afternoon opening at 356 was full-on communal playtime—and, seemingly, a beacon to all local vegetarians and parents. Family-friendly fun! Free touch therapy! Interspecies bonding! Infants and toddlers ran the show. Cuteness was off the charts. There were squeals of euphoria and lots of cats skedaddling past small sticky hands still learning how and how not to pet. One oblivious little girl chased a tired old grimalkin into the mega litter box (Rob Pruitt’s Zen Litter Tray)… eww, yucky. Impossible to say who was entertaining who. Sitting in the viewing aquarium or circling it from the outside, I felt some kind of role-play social trap starting to take hold. Then again, cats are well known to breed suspicion and paranoia… and weed is, like, basically legal here. Rhonda Lieberman gives a talk at 356 S. Mission Road. 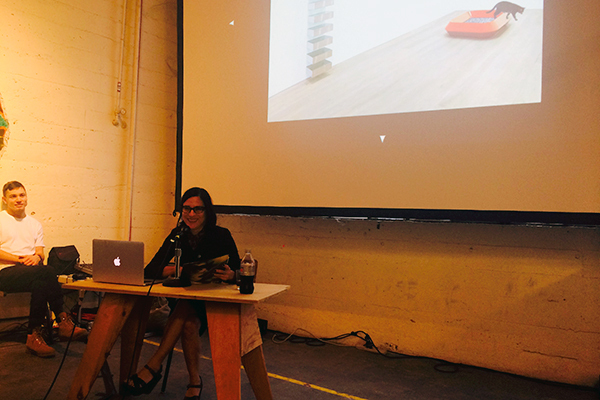 At 4 PM, she gave a contextualizing slide-show talk that posed pussies atop the Minimalist canon, tailing cats as repressed art-historical material and tracking their influence: litter from Judd’s boxes and LeWitt’s jungle gyms to Sandback’s taut yarn and Bruce Meowman’s nocturnal cat-and-mouse games. More than representational, art wants to be new ways of living. Politically, Lieberman’s exhibition is a strong animal rights—or should I say (in honor of Sandra, the twenty-nine-year-old orangutan who just had her day in Argentinean court) “non-human person” rights show. This pet project gives a damn about all the planetary life humanity reduces to mere collateral damage. And if her presentation reminded us of anything, it’s that Lieberman is also a born writer who loves cats for the puns they play into and the psychic projections they so gracefully articulate in all their innate physical intelligence, like a clowder of metaphors. An hour or so later, playtime started to wind down for adults, kiddies, and kitties alike as the sun set through the windows in hot electric hues. Overexercising one’s anthropomorphizing muscle all day is emotionally exhausting, and the impenetrability of the nonhuman other remained in me like a hangover after the group interspecies high. Ultimately, the purrsistent impossibility of comprehending the cat returns—uh-oh, melancholy was setting in. The only solution: Put the cat in my bag, take Diesel home.